Check out these five cleaning tips to help you spend less time cleaning, so you can spend your time doing more important things. We all know those people who just seem to be natural cleaners. You will never find a cobweb in the corner or dust on the TV. You know that person who talks about how messy their house is, and it’s so clean you could eat off the floor. This person, is NOT me! I try, I really do. I have set up cleaning schedule, after cleaning schedule, in hopes of some how forcing myself into a routine. It never works. Finally, I had to admit, cleaning is not my strong suit. When I came to this realization, I decided to make changes around our house to make me a more effective cleaner. These changes didn’t happen over night. Some even took a little time to accomplish, but in time, they did help me get my house clean quicker with minimal effort. I now have a neater house, and I can focus more time of the things I really enjoy. Having clutter every where not only made it harder for me to clean, but it was depressing to look at. I would get so upset by all the messes piled up but felt helpless because I didn’t know where to put stuff. This kept me from cleaning anything around it because I would often feel like what was the point. When I started clearing out clutter, our space looked better, and it was so much easier to clean. To rid your house of clutter, it will definitely take one big purge where you focus on nothing but getting rid of stuff. After that, it’s about maintaining what you have accomplished. I keep a donation box going at all times. That way when I come across something that doesn’t have a place or we haven’t used in a while, it can go immediately into the box. Having cleaning supplies in the location where they are needed is a great help. For example, keeping the Swiffer close by for kitchen messes and bathroom cleaning supplies in the bathroom. That way, when a mess happens, they are close by. If you have to go across the house to get something to clean up a mess, chances are it will have to wait, which just makes the mess harder and more time consuming to clean up later. This also makes it easier when you notice a mess, to clean it up right then. Like when you see a cobweb looming in the corner or a dirty toilet, you have the supplies nearby to take care of it. Paper piles are one of my biggest problems. So in order to stop the junk in its tracks I made an easy organizing system to catch paper as it comes in the house. Upon entering my house papers are immediately filed into one of two hanging folders depending on what action is needed — to be returned or to file. I know that the junk spots are different for each house, so think about where yours are and how you can keep those items contained. For example, an entry way where the kids throw their stuff, maybe a few basket designated for those things would help. You won’t find me necessarily blocking off hours of the day to clean, as more than likely, I will be throwing in a load of wash in between other task. Cleaning the kitchen while making supper or straightening up the bathroom counter while getting ready, that’s what works best for me. This is another reason why having supplies that are accessible helps me get more done. I also like to have supplies that are easier to use. I love that when I need to clean a floor I don’t have to go get a mop and bucket, all I need is my Swiffer and the mess is taken care of quickly. I don’t know of a single family that isn’t busy, so in this day and time it is important to find ways for everyone to help. 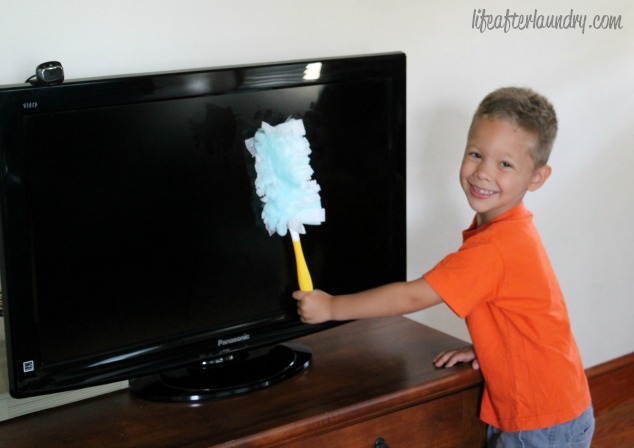 My son loves to help clean, but it isn’t always helpful for him to be involved. I don’t want him near strong cleaners and when he uses a broom, things usually end up just getting pushed around. Coming up with ways for him to contribute were a little more challenging. Well, until I found that the Swiffer products make it much easier and safer for him to lend a hand. Plus, he was actually helping. The Swiffer cloths are like magic and dirt, dust and dog hair are just attracted to them, not pushed around. I’m embarrassed to show this picture, but it is a perfect example of how much easier Swiffer makes cleaning for all family members. 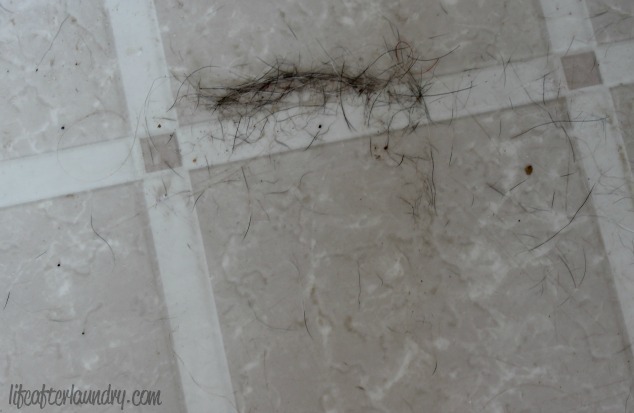 See the dog hair that has collected by the wall. I would usually be chasing something like this with the broom, but the Swiffer grabs it up immediately making less work for me. You can see the difference one pass over the spots made. I have to say it is kind of fun to clean with those kind of results, and if you can make cleaning fun you will be able to get a little more involvement from the whole family in the cleaning process. 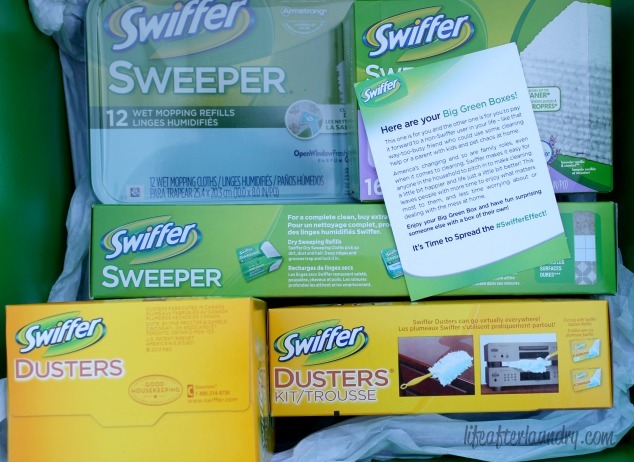 Have you heard about the #SwifferEffect or the #BigGreenBox? You read about my Swiffer Effect story above, and how much of a difference it has made for my family. Swiffer was so great to send me a Big Green Box full of supplies to make my cleaning process easier, and one to pass along. When I recivieve my box I was thrilled at how gracious Swiffer had been in send me all of these product, and instantly I knew just who needed a box for themselves. My little sister has recently moved into her first apartment. Being a working college student she doesn’t have a lot of time, so she needs things to help her clean quickly and effectively. The Swiffer is also work great for apartment living. She would have one product that would work as a mop and broom and no need for that annoying bucket. She was very surprised and excited about all the stuff the box contained. It made me feel so good to be able to give this box to her. 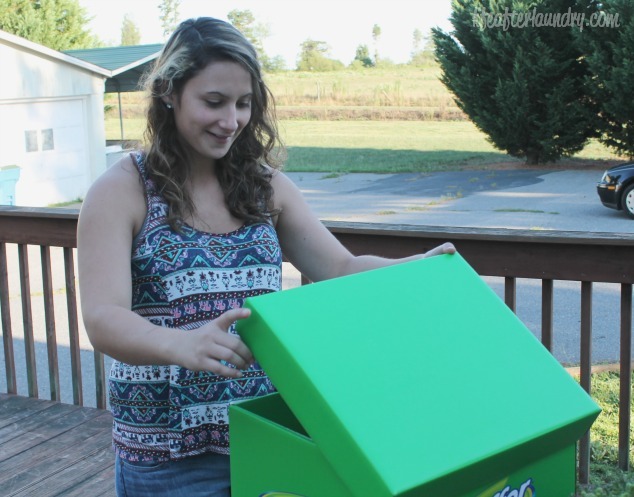 I knew it would be something that would help her, and it was a perfect housewarming gift for her first apartment. 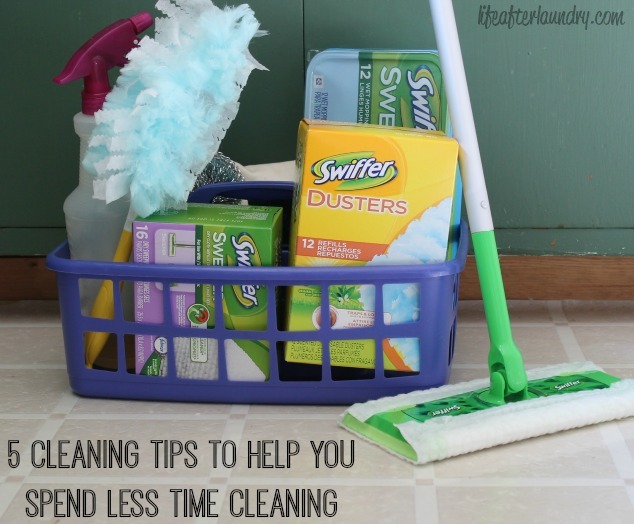 Have you tried Swiffer yet? 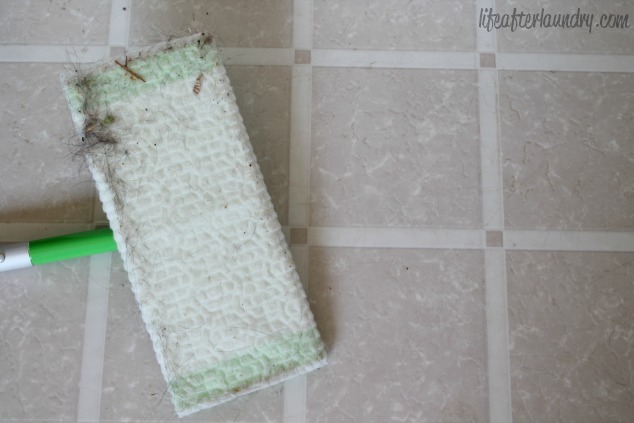 Do you have a Swiffer Effect Story? Thanks for the great tips on this! I know that person you are talking about at the beginning of this post. it is my mom! That lady has a house so clean you could eat off the floor. When she says her house is a mess, I often wish my house was “that messy”. My clutter collects on my desk. I’m trying to keep it cleaned up so I can actually use my desk, but some days I lose. Know what I mean? We love Swiffer too and now that my almost two year old grand daughter is showing that she likes to clean, I will hand her there duster for sure. This is such a helpful post..Thank you so much for your tips! Clean as you go is a given rule in the house. My kids are nagging no more about this and the only problem now is the constant hair fall. I have to look for that swiffer! Thanks for this Brenna. I have used Swiffer products. They are amazing. My sister recommended them to me. I am so glad I follow her example and start to use them. Cleaning is really easy and fast. I have 3 kids and I don`t have a lot of time for swiping and mopping. Thank you for sharing your article! Best regards!